This is batch #3 from That Boutique-y Whisky Company, and only 365 bottles were made. The whisky is pale as myself, but the sweet peaty flavours is just hitting the nose beautifully! It is 52,3%, but it doesn’t attack the nose. It is just sweet peat, earth and a heck of a lot of white fruits. The peat is subdued, but you have no doubt that this is an Islay whisky. The peat comes rushing in at first in the taste. It just feel like it fills your mouth, as the water starts to run. Sweet fruits. Is it something exotic like pineapples and coconuts, or something more like peaches and pears? I shift my opinion every time I take a sip. The sweetness stays for quite a while, while the peat dies out in the finish. 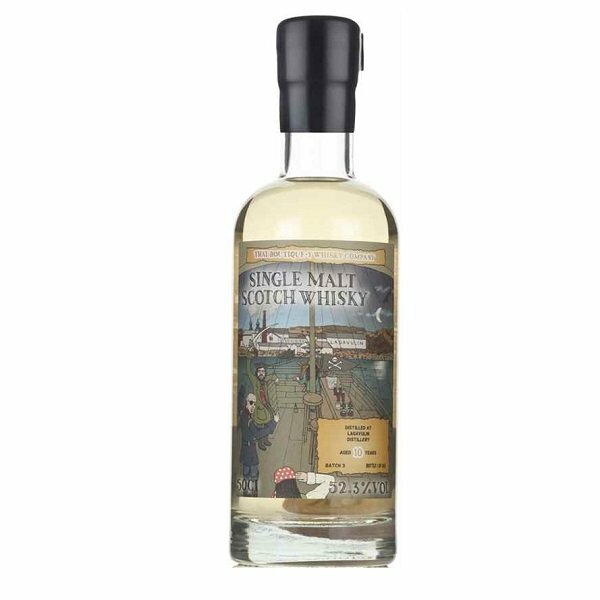 Young cask strength Islay whiskies really have personality, and That Boutique-y seems to know what they are doing. This is just pleasant and the peatiness is not overwhelming at all, and compliment the high ABV very well (remember it is still an Islay whisky!). I will rate this 90/100 (22/23/23/22).